This battery was engaged here April 7, 1862 at about 10 A.M., in an artillery duel with Union batteries in Jones Field. Location. 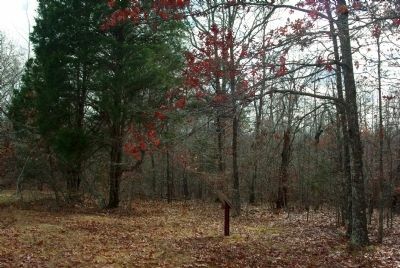 35° 8.705′ N, 88° 20.783′ W. Marker is near Shiloh, Tennessee, in Hardin County. Marker is on Cavalry Road 0.1 miles east of Sherman Road, on the left when traveling west. Touch for map. 250 yards south of Cavalry Road at south edge of Jones Field, in Shiloh National Military Park. Marker is in this post office area: Shiloh TN 38376, United States of America. Touch for directions. of this marker); Shaver's Brigade (about 300 feet away, measured in a direct line); 11th Iowa Infantry (about 400 feet away); Schwartz's Battery (about 400 feet away); 53rd Ohio Infantry (about 400 feet away). Touch for a list and map of all markers in Shiloh. More. 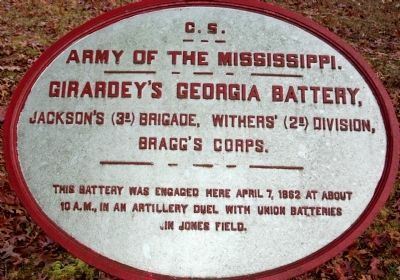 Search the internet for Girardey's Georgia Battery. Credits. This page was last revised on June 16, 2016. This page originally submitted on December 1, 2010, by Allen Gathman of Pocahontas, Missouri. This page has been viewed 365 times since then and 4 times this year. Photos: 1, 2. submitted on December 1, 2010, by Allen Gathman of Pocahontas, Missouri. • Craig Swain was the editor who published this page.